Colorful entertainers at the 2012 Dine Out Vancouver Plated & Paired event. Photo by Sue Frause. I took a snowy ride on Amtrak Cascades to Vancouver in January 2012 for the opening night event of Tourism Vancouver's annual Dine Out Vancouver Festival. 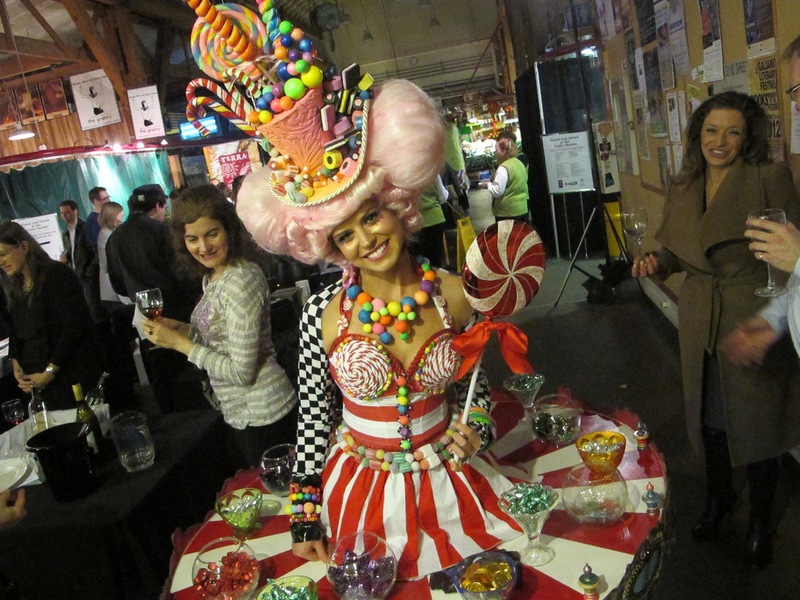 This year they're again kicking off the foodie festival with Plated & Paired at the Granville Island Public Market. The after-hours event is Friday, January 18 from 8-10 PM, and features chefs from four of Granville Island's restaurants (Bridges Restaurant, Sandbar Seafood Restaurant, The Keg on Granville Island, Edible Canada). 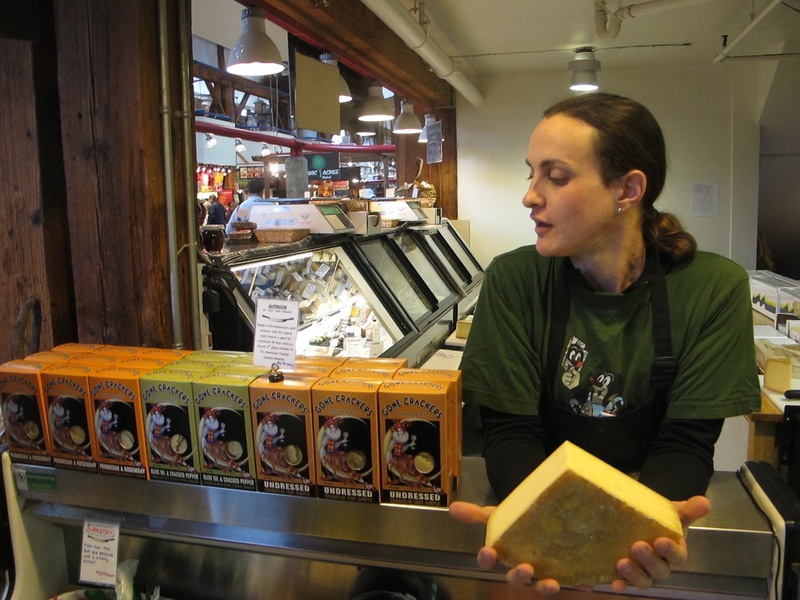 There will also be a dozen food vendors from the Public Market, along with 34 BC wineries. You won't leave hungry! Granville Island Public Market. Photo by Sue Frause. It was a bit crowded for my taste, so be prepared to do some elbowing and cozy schmoozing, and wear comfortable shoes. 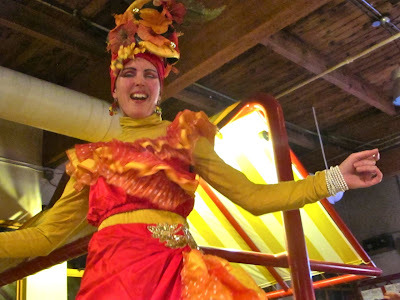 Live jazz will add to the mix, and no doubt there will be some colorful characters at the event. Plus, it's fun to roam around the Public Market after hours. Tickets are $38 and go on sale Friday, December 14. They may be ordered online at dineoutvancouver.com/events. Benton Brothers Fine Cheese will be at Plated & Paired. Sue Frause photo. Now in its 11th year, Dine Out Vancouver runs January 18-February 3, 2013. The 17-day festival offers three-course, prix fixe menus priced at $18-$28-$38. More than 200 restaurants (to be announced online January 7) are participating, along with "flash in the pan" foodie events. A number of Vancouver area hotels are offering special Dine Out Vancouver room rates and packages. 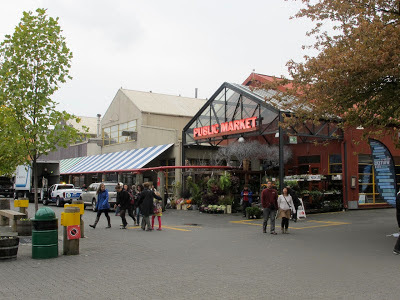 I stayed at the Granville Island Hotel last year, so it was an easy trek for me to the Public Market event, with breakfast the next morning at Edible Canada. This sweet lady showed up at Plated & Paired in 2012. Will she be back in? Photo by Sue Frause. Returning this year along with Plated & Paired are Street Food City; Secret Supper Soiree; and Act I, Eat 1. New additions include The Grape Debate (a lively wine debate followed by BC wine pairings); Tea Cocktails & tapas (tea-infused cocktail class paired with tasty tapas at The Urban Tea Merchant); and a experiential Speaker Series at Edible Canada on Granville Island where you'll taste cheese, wine, beer, bitters and more with the guidance of a local expert. 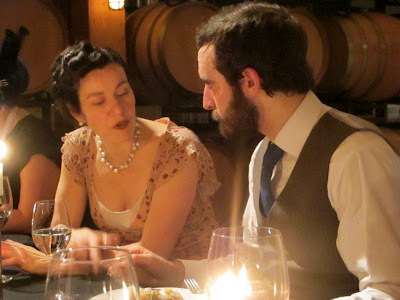 Last year's Secret Supper Soiree during Dine Out Vancouver. Photo by Sue Frause.